A fountain of lava erupted from a fissure on Kilauea Volcano, Hawaii on March 5, 2011, beginning an eruption that would end four days later. A group of scientists led by Paul Lundgren of the Jet Propulsion Lab have observed the details of this eruption without having to set foot on the volcano using InSAR imagery and GPS data from the Hawaiian Volcano Observatory, USGS, available at UNAVCO. 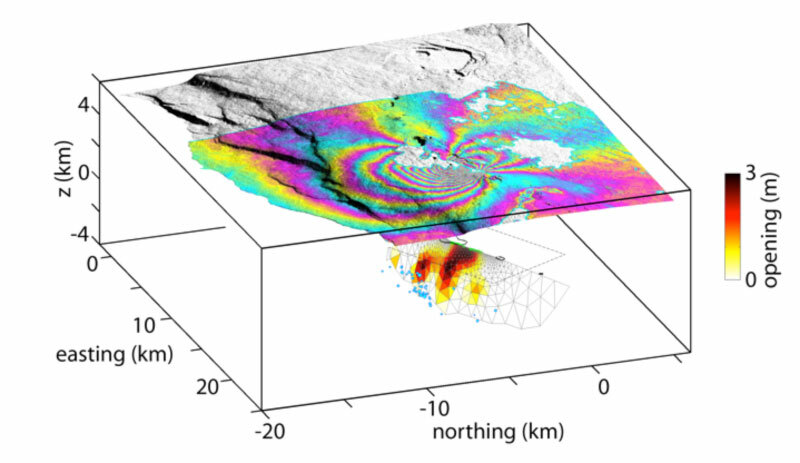 InSAR is a technique that uses images created with radar to measure ground motion. A satellite flies over an area of interest, and creates an image of the ground elevation below by shooting and then receiving the reflected radar waves. After an area moves, say due to the motion of underground magma, the satellite flies over again and creates a second image. These two images can be compared to see what moved and by how much, accurate to several millimeters. 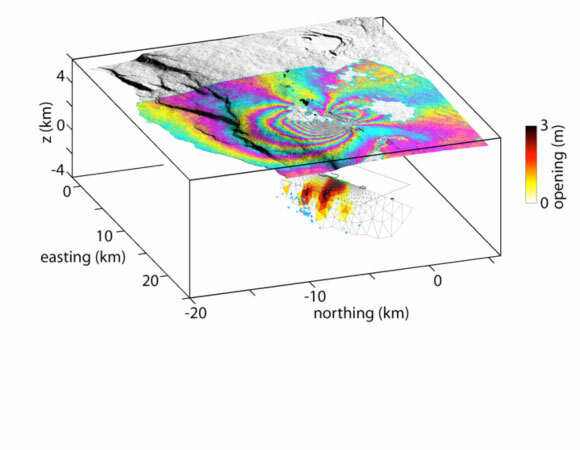 Lundgren’s group was able to obtain InSAR images for several different time periods throughout the eruption. 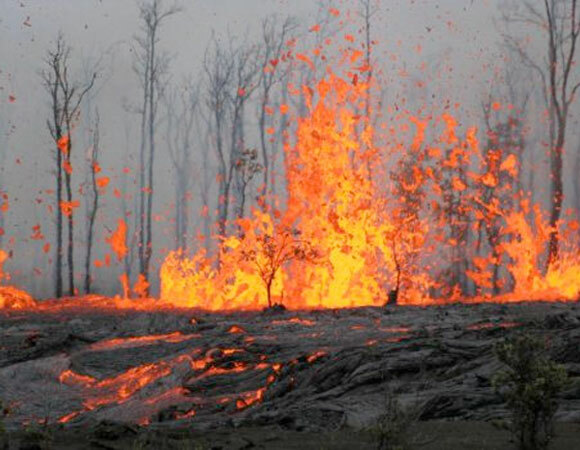 They also used GPS data from the Hawaiian Volcano Observatory, USGS (available at UNAVCO) in the region to use a second technique to observe ground motion. Using these data, the group was able to model the shape and location of an underground dike and the amount of magma that was injected into the dike during the eruption. The models showed the progressive opening of the dike as it was fed magma from deeper sources in the volcano. The dike is no longer active, but the group is monitoring the ongoing deformation that occurs after an eruption and for signs of impending future eruptions. Figure 2. The Kamoamoa Fissure (Photo by USGS). 2012 UNAVCO Science Workshop abstract: P. Lundgren, M. Poland, A. Miklius, S.-H. Yun, E. Fielding, Z. Liu, A. Tanaka, W. Szeliga, and S. Hensley. Application of InSAR and other geodetic observations to constrain deformation sources at Kilauea volcano.